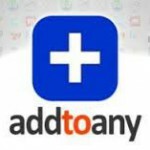 This plugin integrates Affiliates Enterprise with AddToAny -The Universal Sharing Platform- and their Share Buttons by AddToAny WordPress plugin. With Affiliates Enterprise and the Share Buttons by AddToAny plugin, the extension requires no specific setup – URLs to pages shared are converted into affiliate links automatically when affiliates are logged in. Access to this extension is included with Affiliates Enterprise.